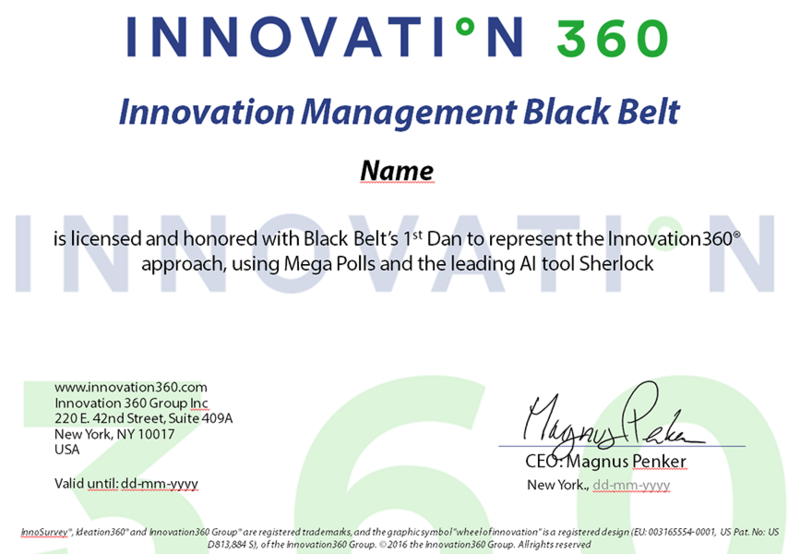 Be awarded with Innovation360´s “Innovation Management Black Belt” highlights success in the recipient and guarantees that they boast integrity, professionalism, and in-depth knowledge of Innovation Management. The Black Belt community are at home in our inner circle, and those who achieve the Second Dan (which is also called the Master Black Belt) or higher are part of the faculty that develops our methods and tools. If you attain your Master Black Belt, you can also aid as an instructor at our accreditations. All those with a Black Belt are active practitioners and annually invited to in-depth closed sessions, on a rotating schema, from continent to continent – giving them the chance to mold the future of innovation management. We, hereby, proudly announce all our Black Belts.